A mechanic’s lien in New York lasts for one year from the date of filing. In order to extend a mechanic’s lien on single family dwellings and certain other liens, a motion to extend a mechanic’s lien is required. In a March 19, 2014 decision, the Second Department of the Appellate Division confirmed that, pursuant to Lien Law Section 17, an order to extend a New York mechanic’s lien may be obtained without notice. The reason is that such an extension creates no new liability. The property owner in the case appears to have also argued that Lien Law Section 17 is unconstitutional because it allows for an extension without notice. The Appellate Division did not accept this argument and affirmed that the lien foreclosure action was timely based upon the properly granted extension. 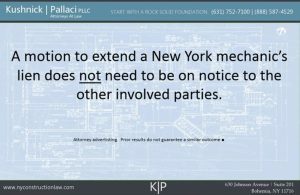 As such, under current New York law, at least in the Second Department, a motion to extend a New York mechanic’s lien does not need to be on notice. 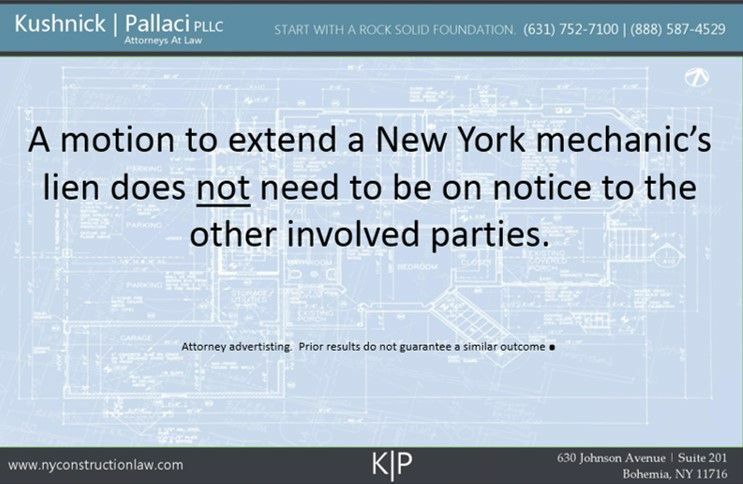 The attorneys at Kushnick Pallaci often file special proceedings related to mechanic’s liens including motions to extend New York mechanic’s liens. You can contact one of our construction attorneys here to discuss how we can help extend your New York mechanic’s lien. For the decision see Polluki Constr. v. Capobianco. This entry was posted in Lien Foreclosure, Mechanic's Liens and tagged Lien Extension, Liens by VTP. Bookmark the permalink.